Sideshow presents the Jean Grey Premium Format™ Figure. making her way into the X-Men Collection. The Jean Grey Premium Format™ Figure measures 21” tall as the mentally-gifted mutant hovers over a snowy landscape base. Pink tendrils of her telekinetic power rise from the ground. lifting rocks and holding the graceful heroine aloft as she aids her fellow X-Men in battle. 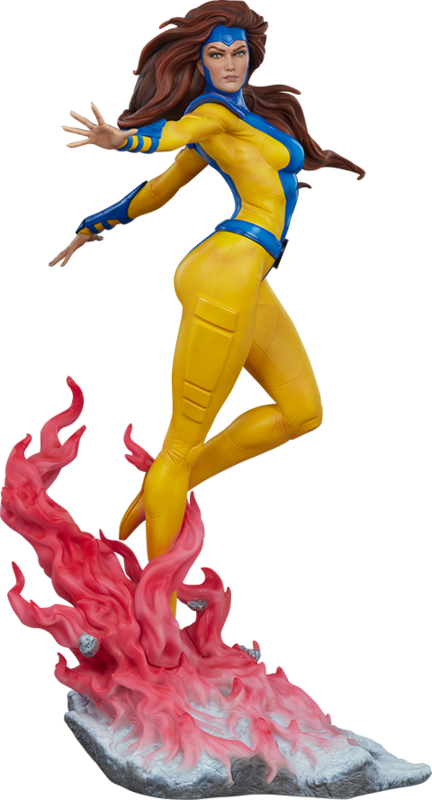 The Jean Grey Premium Format™ Figure features an entirely sculpted costume. inspired by her 90s era X-Men Gold team uniform. Jean has a sculpted yellow and blue bodysuit with detailed paneling and raised elements. along with blue gauntlets. shoulder pads. and an open cowl. At her waist. Jean Grey wears a red and black X-Men insignia buckle to complete her classic look. while her signature red hair flows dramatically behind her. Pair Jean Grey with other notable members of Sideshow’s X-Men Collection. including Wolverine. Mystique. and Emma Frost. and unleash the ultimate mutant lineup in your Marvel collection.